About the Author: Meribeth Dayme resides in the United Kingdom. She is a well known author of self-help and personal power books. Meribeth, a former University professor of singing and anatomy is also the Director of Free Chocolate Cake Ltd. Through her words she proves to be a very creative thinker with an amazing ability to express and teach to others about their own personal power, self-esteem, and their inner spiritual and physical balance. Meribeth Dayme manages to reach her readers deep down in their subconscious in order to instill positive learning habits. She uses a very good technique in training ones brain with new knowledge as they read. is a very well written book that everyone should read. Everyone needs to find a balance in their abilities to deal with the pressures and demands in their workplace, even in their day to day life. 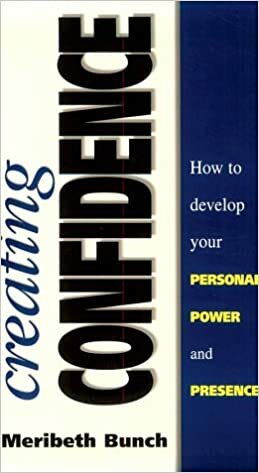 Creating Confidence will teach you about redefining your personal power, how to rebuild and use your confidence to its highest level, how to communicate, and use your body language in a more positive and effective manner. Creating Confidence will show you how to use your imagination, how to use visualization to overcome obstacles that build walls around your personal growth and you will also learn to deal with self criticism and not let it work against your self-esteem and self-worth. One phrase that really caught my attention was, “Your space is an energy field that can be expanded or contracted at will”. Meribeth Dayme takes you even further in her book “Creating Confidence”, to a section on how the clothing that you wear affects your own confidence and self assurance and how it sends negative or positive messages. One of the interesting strategies that the author uses to get her point across to her readers is her pictures. The pictures are very simple but direct in placing a memory card in your mind. Pictures speak louder than words, the method to her madness in that idea. Creating Confidence is an easily read and understood book due to the case studies that the author strategically places throughout her chapters. I can go on and on and will miss out on something. This book is extremely educational and full of very good information and I doubt that anyone that reads it will walk away disappointed. Recommendation: Womensselfesteem.com highly recommends this book to everyone that has an ability to read. You cannot help but feel positive about yourself after reading "Creating Confidence". Thank You Meribeth for giving many lessons in one read. Creating Confidence is available for purchase from Amazon.com.